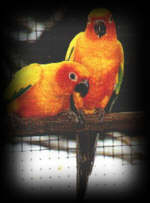 If you are producing Exotic Birds. . . The Exotic Bird Harness. . .
Each harness is custom made by hand to the exact dimensions of each bird. The harness was designed primarily for working professional magicians that produce exotic birds. 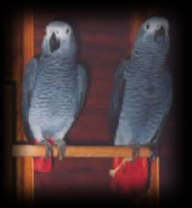 For Cockatoos, Macaws, Conures, Greys and other similar sized birds. The exclusive safe and comfortable design allows the bird to be positioned comfortably on a perch without anything touching the body. When the bird is produced it will look its best - without any broken or ruffled feathers. Each harness is made with a quick release - using only one simple movement by the performer. Tested under actual performance conditions and as you know it's the little things that make the difference. Bird Dimensions . . .
produce a harness for your bird. top of the birds head to the perch. perch to the tip of the birds tail. the broadest part of the shoulders. And. . . the type bird you have. Performer walks on stage carrying an artist's sketch pad casually at his side. He bows and raises the pad to his shoulder and proceeds to draw a parrot on the pad and replaces the cap on the marker. Pad is closed, held between both hands and squeezed making a gap in the pages. Instantly a full size parrot slowly walks out and perches on top of the pad to thunderous applause. This, of course is the (fully authorized by KJ) adaptation of the Kevin James Bowlarama. This is the easy way to produce an exotic bird without having to do a whole dove act. It is portable, reliable, and highly visual. Anyone seeing Bowlarama knows that it has high impact - now producing a bird is a super surprise with a live bird. The pad is all new and totally redesigned in order to accomplish the production. This is very easy to do has a fast reset and there are very little angle problems. Audiences gasp as the bird walks out of the pad. The pads are hand-made and will last a lifetime if properly cared for. The originator has used his original prototype for over 300 shows and is still using it. 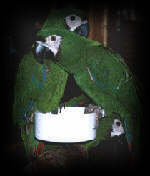 The pad will accommodate a parrot that is 20" from the tip of his head to the end of his tail. 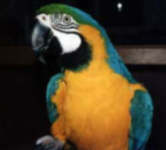 This makes it ideal for conures, greys, militaries, amazons, mini-me caws, and cockatoo's." Includes the special pad, enough paper to do 100 shows, the perfect marker, special glue stick, and video instructions.